Mesut Ozil racism claims ‘nonsense’, says ex-Germany team-mate Toni Kroos – Royal Times of Nigeria. Real Madrid midfielder Toni Kroos says former Germany team-mate Mesut Ozil was talking “nonsense” in his retirement announcement last month. 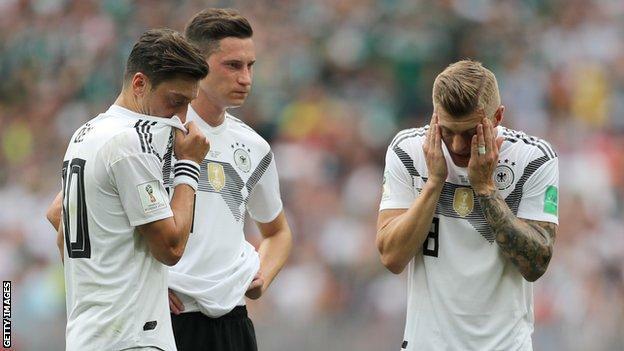 Arsenal midfielder Ozil, 29, quit international football after Germany exited the World Cup in the group stages, citing “racism and disrespect”. In a statement, Kroos said Mesut deserved a better departure and the way he resigned was not in order. Ozil faced criticism after being photographed alongside Turkish president Tayyip Erdogan in May and was one of the players blamed for Germany’s disappointing World Cup campaign in Russia. Ozil also accused the German Football Association (DFB) of failing to support him during the row. He said in his retirement statement that he is considered German when the team wins, but he is an immigrant when they lose. Kroos also said that the parts in Ozil’s statement that are rightly addressed are unfortunately overshadowed by the significantly higher amount of nonsense. He also said that racism within the national team and the DFB does not exist. Ozil won 92 caps for Germany and was part of the 2014 World Cup winning team. He was voted the national team’s player of the year five times by fans.